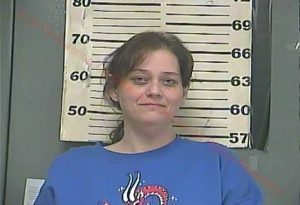 Raceland, Kentucky – (February 2, 2019) The Kentucky State Police, Ashland Post was originally contacted in January, 2019 regarding the suspected embezzlement of more than $16,000.00, by the former Raceland City Clerk, Rebecca Miller. Miller was implicated after the newly elected Mayor, Talmadge McPeek, ordered an audit of city funds and discovered apparent misuse of the city’s credit card. The investigation revealed that the card had been used to purchase tickets to a Jeff Dunham show, personal items, and other matters not related to city expenses. Miller was arrested Friday, February 1, 2019, and was charged with Fraudulent Use of a Credit Card, $10,000.00 or more, a class C felony. She was lodged into the Greenup County Detention Center without incident. The investigation is ongoing, and is being conducted by Detective Jeff Kelley.